The incident began Friday morning as a plane from Minneapolis was landing at Phoenix Sky Harbor International Airport. He allegedly touched people in the face and sprayed something from a spray bottle on them while on the flight to Sky Harbor International Airport. Authorities say a flight to Los Angeles returned to New York's Kennedy Airport shortly after takeoff because it had struck a sign and light on the runway. Police say none of the passengers desired prosecution against the man, but trespassing charges are pending. Johnson, who was sitting three rows in front of the passenger, shared video of when she finally exited the plane. He landed on the ground approximately 10 feet below, sustaining minor injuries. Both law enforcement and paramedics responded, American Airlines said in a statement to CNN. 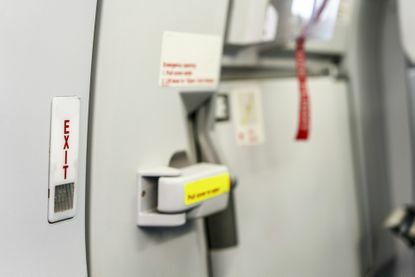 According to the Arizona Republic, the passenger, whose name has not been released, became disruptive during the flight and led the flight crew to call for the police to meet the aircraft.